Instead of playing the lottery, I play interlibrary loan. Each week, I hit the library with a stack of request slips for books I've heard about that aren't stocked by our tiny rural book-lender, and every week something trickles down from northern Virginia to fill my voracious book appetite. This is the saving grace of our tiny library --- interlibrary loans are free. I try to put in requests for an equal number of fiction and non-fiction books each week, but as luck would have it, this week's haul was entirely fiction. I gulped in dismay, and headed back into the library's one small room of non-fiction on the off chance that their linear foot of gardening books included a tome I'd not yet read. And there in front of my snooty nose was a book every bit as good as the ones I'd requested from afar. 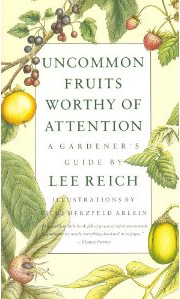 In fact, even though I'd never heard of Lee Reich's Uncommon Fruits Worthy of Attention, all of my permaculture gurus clearly had. Information about species like the hardy kiwi and the Nanking cherry had eluded me because these plants were nearly impossible to find on the internet (even though every permaculture book mentioned them.) I flipped open Lee Reich's book and found that it was chock full of cultivation and propagation information for these and seventeen other unusual species. By the end of the week, at least four of these species will be adequately represented on the internet --- stay tuned! Check out our ebook about making a living on the land. I believe you have an older version of what is currently pressed as Uncommon Fruits for Every Garden (Timber Press). I love this book! A great companion to it is Reich's Landscaping with Fruit (Storey Publishing), which features both common and uncommon fruits. After reading these, I put in a few pawpaws and a quince tree in my tiny front yard. The quince is thriving but the location is a little challenging for the pawpaws, which bud later anyway. I may have some photos up soon. It sounds like I'm going to have to check out the more recent edition! My interlibrary loan list just gets longer and longer.